Left to right, Michael Wolf, regional director Asia-Pacific, Frank Bungartz, general manager and Anoop Misra, head of Bungartz Liaison, Mumbai. German pump manufacturer Bungartz demonstrated functional models from its self-regulating centrifugal V-AN range and MPCVAN pump at the Chemtech World Expo. 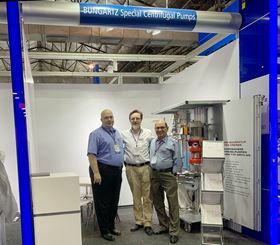 Michael Wolf, regional director, Asia-Pacific at Bungartz presented both pumps under the heading Self-regulating centrifugal pumps for a higher plant reliability. He discussed pump failures, faults and the interruption of the production. Using the example of a self-regulating, dry-running pump from the V-AN range, he explained the application of a safe pumping technology to enable a reduction of overall operating costs. The company is celebrating at the production facility in Euskirchen in the Eifel region.